There have been lots of weather systems moving through Southern California during this winter season but we have currently broken out into a stretch of warm and sunny weather without much in the way of wind or high seas. Anglers are getting an early glimpse of the spring season potentially lying ahead. The fishing is also spring like in it’s nature in there being yellowtail to target in the at La Jolla, Los Coronado Islands and further down the Mexican coast at Punta Colnett. Punta Colnett is where the best of the yellowtail action is being found. Sportboats fishing out of San Diego Bay and Mission Bay have been running 1.5-day trips to Punta Colnett with fishing on Saturdays. The trips to Punta Colnett have been returning with lots of fish, with a mixed bag of yellowtail, reds, lingcod and assorted rockfish. Private boater Harry Okuda of Alfresco III reported about fishing on a 1.5-day trip aboard Eclipse out of Seaforth Sportfishing on Feb. 7. The fish count on Eclipse was 26 anglers catching 46 yellowtail and 130 assorted rockfish. The yellowtail at Punta Colnett were mostly quality-sized 18- to 25-pound fish. In addition to yellowtail anglers also caught a mix of quality-sized lingcod, reds, whitefish and rockfish. 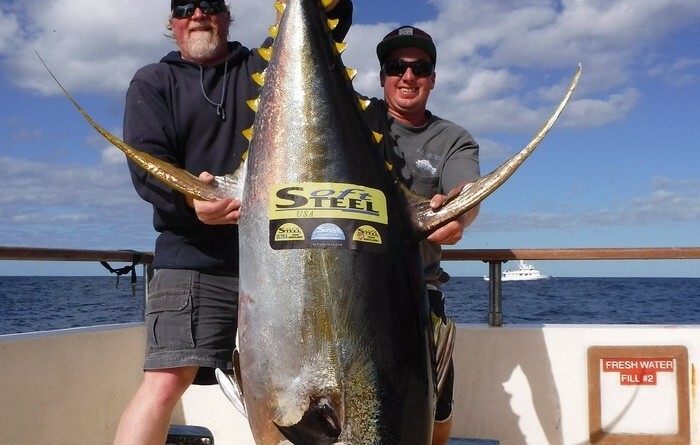 The yo-yoed iron was what produced most of their yellowtail and there were also a few yellows caught on dropper loop rigs that were baited with live sardines or anchovies. Some of the better yo-yo jigs for the Punta Colnett yellowtail have been Salas 7X heavy jigs and Tady 4/0 jigs in the scrambled egg color. 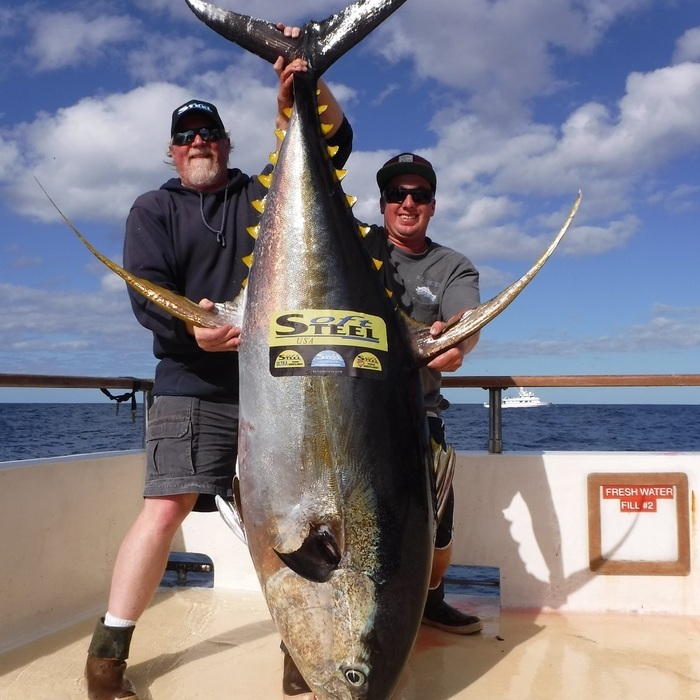 Additional fish counts from 1.5-day trips fishing the Punta Colnett area on Feb. 7 begin with Pacific Voyager out of Seaforth Sportfishing; the 18 anglers aboard caught 29 yellowtail and 90 rockfish. Dominator out of Point Loma Sportfishing had 14 anglers catch 55 yellowtail, 6 barracuda, 30 rockfish, 10 lingcod and 4 bonito. Vagabond out of Point Loma Sportfishing had 27 anglers catch 111 yellowtail and 159 rockfish. H&M Landing had 31 anglers aboard Chief return with 111 yellowtail, 155 reds, 5 lingcod and 39 rockfish. Fisherman’s Landing had Pacific Queen out on a 1.5-day trip with 33 anglers catching 127 yellowtail and 165 rockfish. Yellowtail have also been biting at Los Coronado Islands. A couple of sportboats fished three-quarter day trips to Los Coronado Islands on Feb. 7 and they both found yellowtail biting. Mission Belle out of Point Loma Sportfishing had 17 anglers catch 73 yellowtail and 2 sand bass. Malihini out of H&M Landing had 15 anglers catch 16 yellowtail, 53 rockfish, 1 calico bass and 2 bonito. There have been smaller 5- to 10-pound yellows biting at spots inside of South Island and at the Middle Grounds. The larger sized 10- to 20-pound class yellowtail tend to be found while fishing spots around North Island. The best zones for boats fishing the North Island area have been outside of the south tip of North Island, along the weather side of North Island and into the north of North Island. A good depth range to locate a school of yellowtail around North Island has been in 18 to 40 fathoms of water. An ongoing reminder is the annual two-month rockfish/groundfish closure is in effect in California waters until March 1. The fishing for rockfish is open in Mexican waters and there has been good rockfish fishing reported by boats fishing around Los Coronado Islands. The best area has been the hard bottom to the north and to the northwest of North Island in 40 to 50 fathoms of water. Another productive rockfish zone in the region of Los Coronado Islands has been at the lower end of the 9 Mile Bank while fishing on the Mexico side of the border. Premier out of H&M Landing has been fishing for rockfish at areas out by Los Coronado Islands on weekday morning half-day trips and on their most recent trip had 21 anglers catch 127 rockfish and 2 sculpin. With the rockfish/groundfish closure in effect for anglers fishing in Southern California waters some of the anglers who have been choosing to fish coastal areas in Southern California waters have been focusing on fishing for bass and sculpin at hard bottom and structure spots. Productive areas for bass and sculpin along the San Diego County coast have been the Imperial Beach Pipeline, the hard bottom to the northwest of Buoy #3 at Point Loma, the Point Loma Pipeline, the sunken NEL tower off Mission Beach, the Yukon Shipwreck off Mission Beach, the hard bottom along the edges of the kelp beds at La Jolla, the Anderson and Buccaneer Pipelines, the artificial reefs outside of Oceanside and the hard bottom outside of the edges of the kelp at the Barn and San Onofre. Anglers looking for yellowtail along the San Diego County coast have found a few nice sized yellowtail biting at La Jolla. The La Jolla area has also provided a chance at a nice sized white seabass. The bite on these species is scratchy most days but most of the fish that are being caught have been quality-sized 20- to 30- pound or larger fish. The early morning daylight hours tend to be the best for a chance at a yellowtail or white seabass while fishing spots around the upper end of La Jolla. The best zone has been providing a chance at both white seabass and yellowtail has been the area outside of the MLPA closure zone outside of the Cove at the upper end of La Jolla. The second productive area has been more of a yellowtail zone for boats fishing the hard bottom kelp stringer area of Northwest outside of the upper end of La Jolla. A good depth range has been in 15 to 30 fathoms of water. It is still winter but with the warm and sunny weather we are having we are getting an early glimpse of spring. The ocean seems to be synchronized with the weather and is providing some wintertime spring like fishing for yellowtail and white seabass. Keep on fishing and I hope to see you out on the water! Bob Vanian is the voice, writer and researcher of the San Diego-based Internet fish report service called 976-Bite, which can be found at 976bite.com. Vanian also provides anglers with a personal fish report service over the telephone at 619-226-8218. He always welcomes your fish reports at that same phone number or at bob976bite@aol.com.